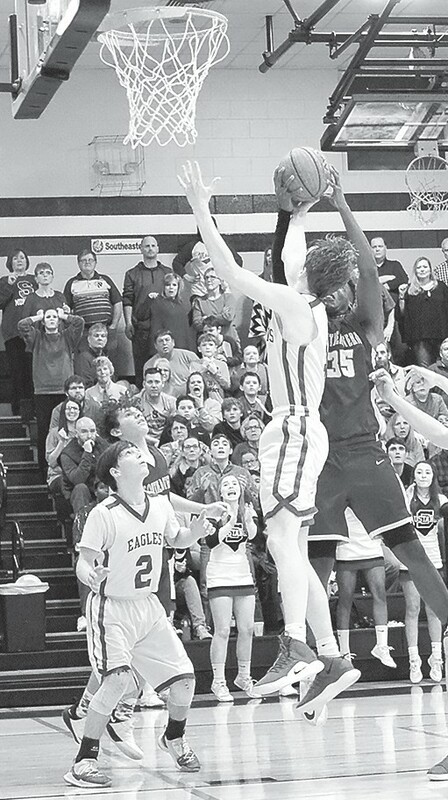 “To win the big games you must get to the free throw line, and then you must make them.” Famous college basketball coach Rick Majerus’ words rang true in the Blount County varsity boys Appalachian vs. Southeastern championship game. The electric gym was full and everyone was holding their breath as Appalachian senior Noah Driggers was at the free throw line. The game was tied; a free throw would win the tournament for the Eagles. Driggers made both and half of the gym went wild. Southeastern led the first quarter 16-10, but fell behind at halftime 30-26. Appalachian maintained their lead in the third quarter 46-41. The Mustangs picked up momentum to eventually tie the game with .03 seconds when Driggers then made his free throws to seal the deal. Ethan Silva led the Eagles with 20 points. Noah Harris scored 16 points. Aidan Driggers had 12 points and older brother, Noah Driggers, scored 11. The Eagles defeated Susan Moore 69-57 in their first round of the tournament. Silva led the team with 20 points. Harris scored 16 points. Aidan Driggers had 12 and Noah Driggers had 11. Max Glaze had 10 points. Appalachian then conquered Cleveland 75-67. Aidan Driggers scored 20 points. Glaze followed with 19 and Silva with 18. The Eagles (14-6) have their sights on winning their area tournament this week. They travel to Cornerstone tomorrow, Feb. 7, to play Westminster at 6 p.m. The winner will play for the area championship.